Individual Tiramisu is a cute treat and a great twist on a classic. imagine a Tiramisu all to yourself? I suppose everyone has a memory of the first time they tried Tiramisu. The layers of creamy mascarpone, laced with coffee and liqueur, coated in chocolate and cocoa. My first taste was in Florence, Italy. On a rare day off, from my job cooking for tour groups in a Villa just off the Piazza Michaelangelo, we were kidnapped by Franco, a local businessman. I say kidnapped, because he squashed four of us into his tiny Fiat at about 10 am and we headed out towards the hills with no clear idea of our destination. Experience in matters to do with Italians told us to relax and enjoy as, there is little point in arguing. Our journey through the Tuscan countryside on a sunny day was punctuated by stops into quaint little places for coffee and later to a small trattoria for lunch. We were the only patrons for lunch that day, but we were treated like long lost family. The amazing sweet fresh tomatoes and the fried sage leaves, the creamy buffalo mozzarella and the pasta with a rabbit ragu and at the end of this incredible meal was the Tiramisu. Unfortunately they had also plied all of us with a great deal of alcohol and the drive home to the Villa was a little perilous. Franco had the radio on full pelt singing all the way, while we luckily, were mostly oblivious to the speed and the bends in the road and singing along with him. Here is my version of of Tiramisu inspired by Valli Littles’ in Delicious Magazine. I’ve altered the layers and the filling to suit the way I usually make it. : I used an individual cake tin tray for this recipe. Theses make a very stunning dessert. They are make ahead and they can al;so be made gluten free. Beat the butter and sugar until light and fluffy add the eggs and beat well. Add the sifted flour and baking powder alternatively with the coffee. The batter should be light and easy to spread. If it seems too thick and gloppy add a Tablespn extra of milk. Put all of the ingredients for the coffee syrup into a saucepan, except the liqueur, (coffee, sugar, orange juice) and bring to a boil. Turn down and simmer for 1 minute without reducing . Add the liqueur and set aside to cool. You can refrigerate it if you like. Empty this into another bowl and clean the whisk and bowl very carefully. Beat the egg white until light and frothy. Then slowly add the extra sugar and beat till soft peaks form ( double volume ). Fold 1/2 the whites into the marscapone mixture and then add the rest folding very gently. 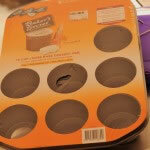 Cut the cake into 12 circles with a cutter that fits the size of your mould. (Put a paper collar around the inside of each mould in your tray if you dont have removable bottomed tins like mine ) Brush each piece of cake with the reserved syrup, generously then place into the mould. Continue with all six then divide the mascarpone between the moulds. Sprinkle each with a generous amount of grated chocolate. Paint the tops with syrup and put onto the top pressing down gently. Refrigerate for several hours or preferably overnight. oh my! They look GORGEOUS. I adore tiramisu and these little individual ones are perfect. Yum! Hey thanks. Every thing home made is better isn’t it? Those individual tiramisu desserts look incredible. 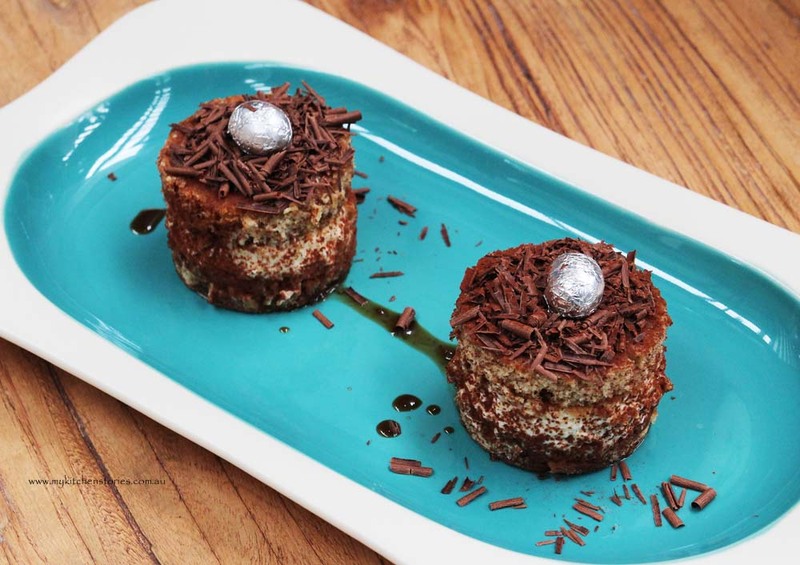 And I love the little silver Easter eggs decorating the top of the desserts – such a good idea for Easter. Oh TANIA! These are so lovely! 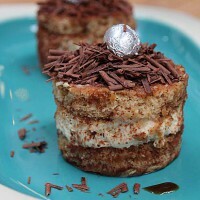 I’ve made tiramisu but these individual ones are just elegant and show the layers so lusciously! I would be more than happy to be kidnapped and driven through the Tuscan countryside! What a great day. 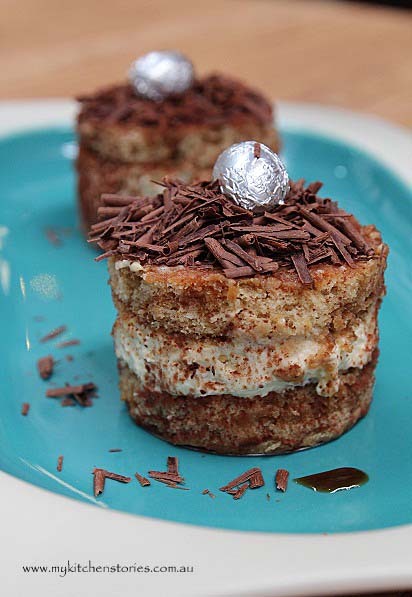 Your tiramisu looks like a lovely way to relive it, and the Easter eggs on top are so cute. What a lovely presentation for tiramisu–I’ve never seen it presented so well. I will definitely try to plate it this way next time I make it. Sadly you are unable to eat it miss! I know! 🙁 My sister in law (who loves her desserts) went all out last year for my birthday as she must have felt quite sorry for me always missing out. She made a massive bowl of gluten free Tiramisu right from scratch. I believe she even made the lady fingers herself. OMG it was divine! How very lovely of her… and nice for you! Gorgeous. I think Valli Little is one of Australia’s best recipe developers. We once stayed with French friends in the southof France and would have an extra glass of wine when dining out so wecould cope with our hosts driving. I guess it’s a European thing! Yes I think so… you just face the car in the direction you want to go and pout the foot on the gas! Lol! My family are French and all my Aunties and Uncles that live over there are mental drivers. They all have a serious case of lead foot! Tiramisu is definitely one of my most favorite desserts EVER and I love how these come in single serving portion sizes! So cute! While I don’t remember the first time I had tiramisu (obviously not memorable for a reason!) I do remember the best – a little cafe in Venice. It was unbelievable. Your little stacks are so cute – love that plate too! I love your individual easter themed tiramisu’s. They are so cute. I love Valli’s recipes, they are always so inspiring. 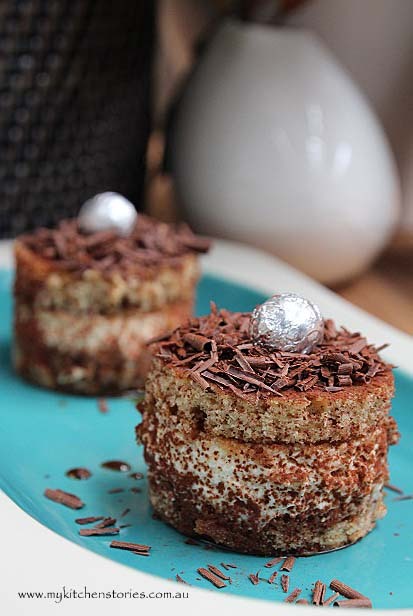 These petite tiramisu look extremely tempting! These are really cute! I absolutely adore this Italian classic…it now looks even better done individually. Love the story as much as I love your lovely little tiramisu. This one looks pretty,I will try this fabulous for my kids!!! Thanks for sharing! !